Rishi (Sour Pope): Oz and I went to Nottingham Uni together and we began jamming together and experimenting with a bit of song-writing. The band went on from there really. The name is slightly bizarre, how did you decide on the band name? Oz (Pope On A Rope): We were watching an episode of the Simpsons – one where Homer ate lots of Chillies and Chief Wigam called him the Pope of Chillitown. We do argue about who decided on the name tho. Who would be the Popes biggest musical influences? Manu Chau. The Smiths. Incubus. Tryo. If you could only choose three words to describe your type of music what would they be? Rishi (Sour Pope): Scruffy, Silky and Saxy. What type of audience do you think you appeal to the most? Oz (Pope On A Rope): We appeal to a studenty audience. Maybe those into rock music and those who are open to styles of music. Also loved by the French. You’ve recently had a change of line-up with the introduction of a sax player, as well as a new bassist, and just today your new drummer. How has this affected your sound? Oz (Pope On A Rope): Liz (Saxy Pope), Oli (Tiger Pope) and Aryin (Toke Pope) all know a bit more about the music stuff. They know more about structure and they make our music more structured. So who’s in charge of writing the Popes catchy songs? Rishi (Sour Pope): Oz and I write the basics of the song. Each pope then adds their own bits to the song. We’re open to different opinions from everyone. What has the Popes best gig been so far? Oz (Pope On A Rope): Has to have been the Dublin Castle earlier this year, it was our first headline slot. What’s happening with the gig tonight? I hear MTV are recording it? Oz (Pope On A Rope): Tonight is a charity event for Oxjam. We’re headlining tonight and it’s being recorded for MTV. Oxjam do quite a few events to raise money for charity. Oli it’s your first night with the band tonight –are you nervous? Oli (Tiger Pope): No. It looks like a great crowd tonight. I’m looking to have a good time and a good gig. How long do we have to wait until the Popes album? Rishi (Sour Pope): Probably about a year. I noticed at a previous gig that you had merchandise for the audience. Who designs it all? Oz (Pope On A Rope): A design company made them for us. Matt Morse was the man who came up with them for us. He’s a great guy! You always seem to have a good crowd with you. Was this always the case? Oz (Pope On A Rope): We’ve never really had a bad crowd – some will start bad but we’re always able to win them over. We’ve networked with the other bands that we’ve played venues with and often pick up new followers from other gigs. What was the Popes first ever gig? Rishi (Sour Pope): It was a school gig in 2001. Our first gig and it didn’t go too well – we had to restart the first song! What does the future hold for the popes? What’s the aim for next year? 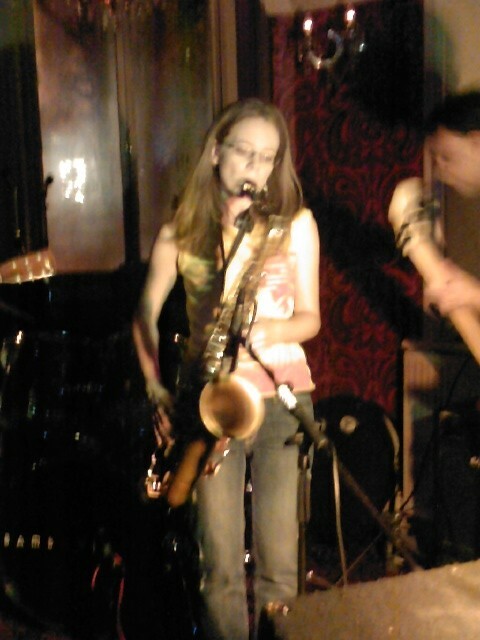 Liz (Saxy Pope): End’eall EP – our first single. Oz (Pope On A Rope): Bigger gigs and some support gigs too. If you could jam with any artist at a gig who would it be? Madness, Manu Chau, Tryo and Timmy Mallet. If you could play anywhere where would it be? Oz (Pope On A Rope): The Astoria definitely, before it gets demolished!